Originally published in the April 13, 2015 issue of Country Weekly magazine. 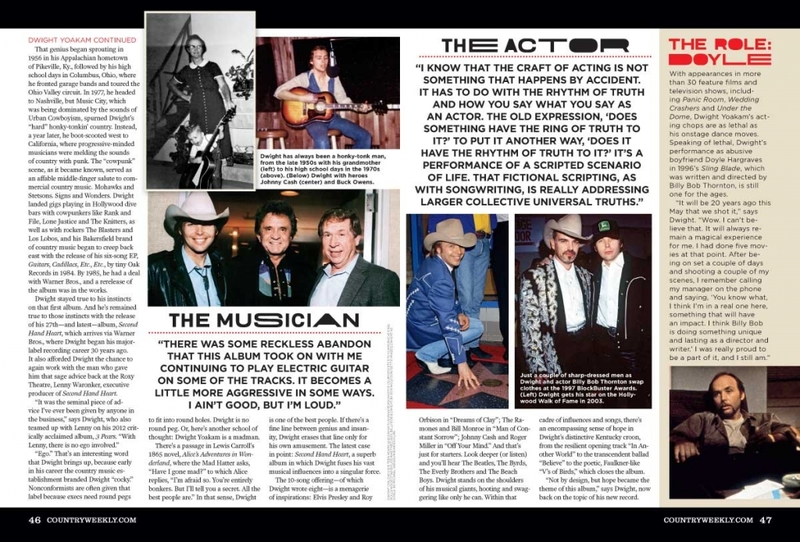 Today, Dwight Yoakam is an acclaimed singer, songwriter, musician and actor. He’s a man of many hats, so to speak, wearing each one in his own pronounced way. But 29 years ago in April 1986 at Hollywood’s famed Roxy Theatre during the major-label release party of his debut album, Guitars, Cadillacs, Etc., Etc., Dwight was just a displaced 29-year-old following his instincts. Yet it was at this party that Dwight received a pivotal piece of advice that has stayed with him all these years later, and it came from a man he barely knew, Lenny Waronker, a label head at Warner Bros.
“You don’t know me very well, I just met you last night, but I’ve been listening to your music, and I’ve watched you. If anybody ever tells you to do something that goes against your instincts, don’t do it.” That’s how Dwight retells the story during our 73-minute conversation, which touches on everything from Guitars, Cadillacs, Etc., Etc. to his new album, Second Hand Heart, and a lot in between, including tangents about the Palomino Club (“a benchmark of my world beginning”), the Vietnam War (“the loss of innocence”) and Sling Blade—three topics that have probably never been discussed in a single conversation with anyone in the history of the world. With Dwight at the helm, you throw interview questions out of the window once he gets the cogs turning. And they are really cranking today in L.A. If anyone in country music has adhered to the maxim of staying true to his instincts, it’s Dwight. And it has paid off in spades for the “hillbilly music” maverick. In his 30-plus-year career, Dwight has sold more than 25 million albums worldwide, earned 21 Grammy nominations and charted five Billboard No. 1 albums. He’s done it without compromising his high-grade, hard-core, honky-tonk music . . . or his attire, including the low-tilted Stetson that generally resides atop his dome and his painted-on Levi’s, which not even Luke Bryan could squeeze into. While Dwight’s instinctive approach to country music has been unconventional, his genius is undeniable. That genius began sprouting in 1956 in his Appalachian hometown of Pikeville, Ky., followed by his high school days in Columbus, Ohio, where he fronted garage bands and toured the Ohio Valley circuit. In 1977, he headed to Nashville, but Music City, which was being dominated by the sounds of Urban Cowboyism, spurned Dwight’s “hard” honky-tonkin’ country. Instead, a year later, he boot-scooted west to California, where progressive-minded musicians were melding the sounds of country with punk. The “cowpunk” scene, as it became known, served as an affable middle-finger salute to commercial country music. Mohawks and Stetsons. Signs and Wonders. Dwight landed gigs playing in Hollywood dive bars with cowpunkers like Rank and File, Lone Justice and The Knitters, as well as with rockers The Blasters and Los Lobos, and his Bakersfield brand of country music began to creep back east with the release of his six-song EP, Guitars, Cadillacs, Etc., Etc., by tiny Oak Records in 1984. By 1985, he had a deal with Warner Bros., and a rerelease of the album was in the works. Dwight stayed true to his instincts on that first album. 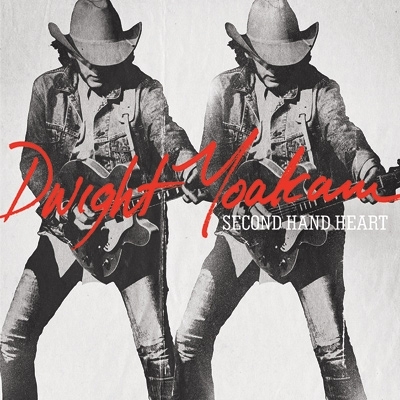 And he’s remained true to those instincts with the release of his 27th—and latest—album, Second Hand Heart, which arrives via Warner Bros., where Dwight began his major-label recording career 30 years ago. It also afforded Dwight the chance to again work with the man who gave him that sage advice back at the Roxy Theatre, Lenny Waronker, executive producer of Second Hand Heart. “Ego.” That’s an interesting word that Dwight brings up, because early in his career the country music establishment branded Dwight “cocky.” Nonconformists are often given that label because execs need round pegs to fit into round holes. Dwight is no round peg. 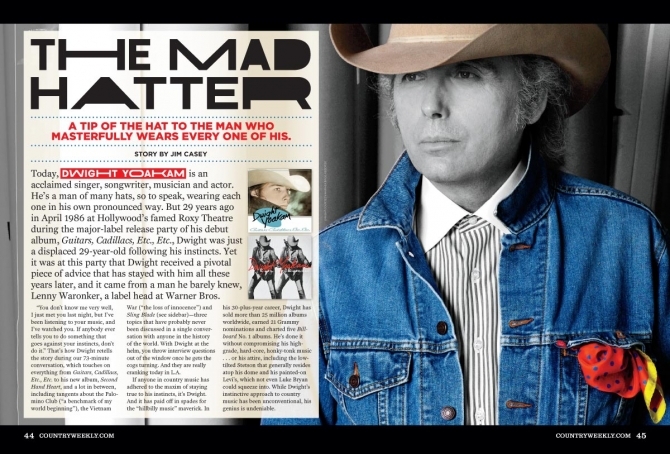 Or, here’s another school of thought: Dwight Yoakam is a madman. There’s a passage in Lewis Carroll’s 1865 novel, Alice’s Adventures in Wonderland, where the Mad Hatter asks, “Have I gone mad?” to which Alice replies, “I’m afraid so. You’re entirely bonkers. But I’ll tell you a secret. All the best people are.” In that sense, Dwight is one of the best people. If there’s a fine line between genius and insanity, Dwight erases that line only for his own amusement. The latest case in point: Second Hand Heart, a superb album in which Dwight fuses his vast musical influences into a singular force. The 10-song offering—of which Dwight wrote eight—is a menagerie of inspirations: Elvis Presley and Roy Orbison in “Dreams of Clay”; The Ramones and Bill Monroe in “Man of Constant Sorrow”; Johnny Cash and Roger Miller in “Off Your Mind.” And that’s just for starters. Look deeper (or listen) and you’ll hear The Beatles, The Byrds, The Everly Brothers and The Beach Boys. Dwight stands on the shoulders of his musical giants, hooting and swaggering like only he can. 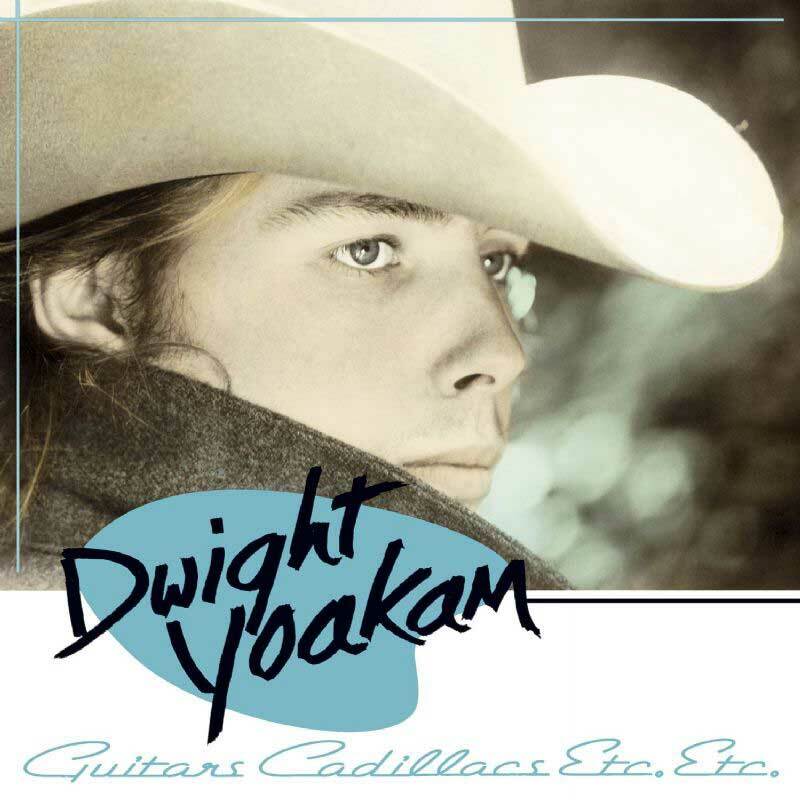 Within that cadre of influences and songs, there’s an encompassing sense of hope in Dwight’s distinctive Kentucky croon, from the resilient opening track “In Another World” to the transcendent ballad “Believe” to the poetic, Faulkner-like “V’s of Birds,” which closes the album. At this point, Dwight pauses for about 10 seconds, which feels like an eternity. But he’s not waiting for a question. He’s thinking. And thinking. And thinking, until . . .
Dwight pauses again. After a lengthy silence, his tone changes from enlightening to pensive. Much of that journey took place in L.A.’s revered Capitol Studios, Studio B, where artists like Ray Charles and Dwight’s hero Buck Owens recorded in the ’50s and ’60s. Dwight and his band—Brian Whelan (keyboard/guitar), Eugene Edwards (lead guitar), Jonathan Clark (bass), Mitch Marine (drums)—cut many of tracks in between gigs as they crossed the country on Eric Church’s The Outsiders World Tour. Not only that, but the record was also made without Auto-Tune or time correction (vouches Grammy-winning engineer Chris Lord-Alge). 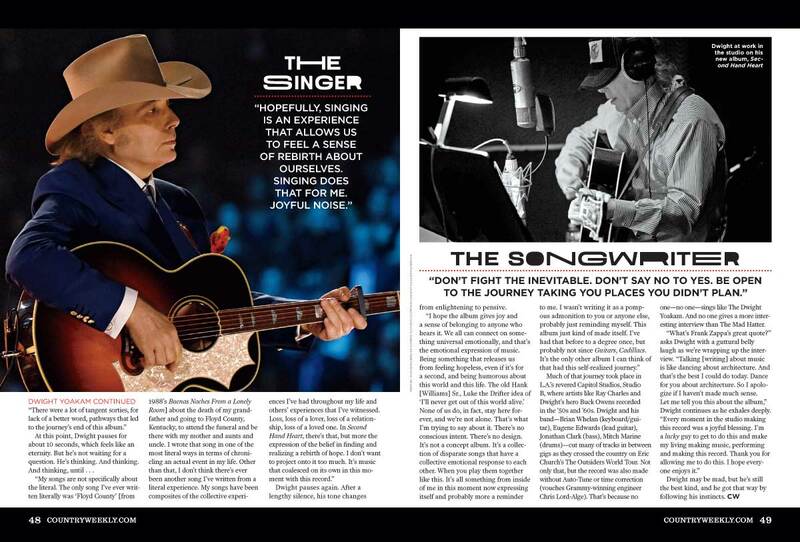 That’s because no one—no one—sings like The Dwight Yoakam. And no one gives a more interesting interview than The Mad Hatter.